Scholarship named after pioneering Argonne scientist. On October 24, the Chicago Chapter of the International Building Performance Simulation Association (CHIBPSA) introduced a scholarship for undergraduate and graduate students named after Ralph Muehleisen, a building scientist and engineer at the Department of Energy’s (DOE) Argonne National Laboratory. Muehleisen is Argonne’s Principal Building Scientist and the Building Energy Decision and Technology Research Group Leader. He currently leads the Urban Science and Engineering Program for Argonne’s Energy Systems Division. His research focuses on increasing the efficiency and resiliency of built environments, and his projects involve urban science and engineering, reduced order and stochastic building energy modeling, understanding uncertainty and risk in building models and the integration of smart buildings and smart grids. “The chapter established the scholarship in Dr. Muehleisen’s name for his advancements in education and research, unwavering mentorship of others, unremitting inspiration to the building simulation community and prominence as an industry innovator.” — Tommy Zakrzewski, the Director of Integrative Energy Engineering at HKS, Inc. and CHIBSPA board member. 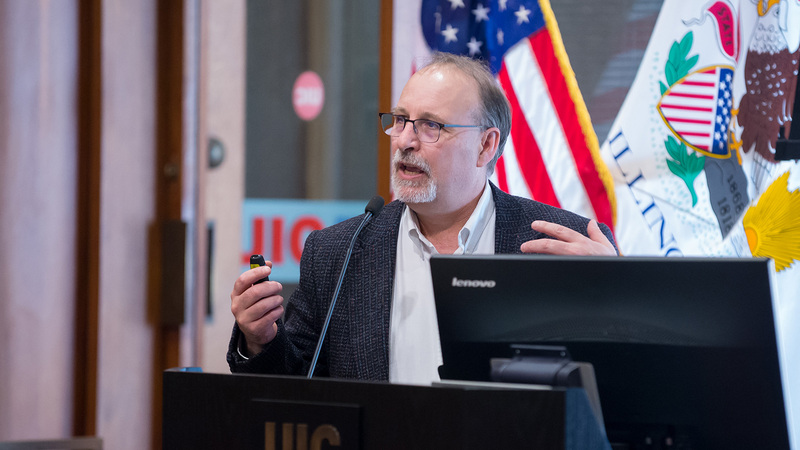 The author of over 180 publications and presentations, Muehleisen serves on the board of directors at IBPSA-USA and as co-chair of the Urban Scale Simulation subcommittee of the organization’s Research Committee. He is also an Adjunct Professor of Civil, Architectural and Environmental Engineering at the Illinois Institute of Technology. CHIBPSA will award the scholarship, called the Ralph T. Muehleisen Scholarship for Building Simulation, to university students pursuing careers in building science and building performance modeling. The scholarship’s name honors Muehleisen for his contributions to the field of building energy modeling and his professional involvement in CHIBPSA, IBPSA-USA, and the American Society of Heating, Refrigerating and Air-Conditioning Engineers (ASHRAE). “The chapter established the scholarship in Dr. Muehleisen’s name for his advancements in education and research, unwavering mentorship of others, unremitting inspiration to the building simulation community and prominence as an industry innovator,” said Tommy Zakrzewski, the Director of Integrative Energy Engineering at HKS, Inc. and a CHIBSPA board member who lobbied for the scholarship’s name. CHIBSPA, which consists of a diverse mix of practitioners, academics and students, introduced the scholarship at its annual fall member meeting. The Emerging Simulation Professionals committee and the Illinois Institute of Technology and University of Illinois Chicago Student chapters of IBPSA also attended the meeting. Dr. Muehleisen leads research to increase the energy efficiency and resiliency of the built environment while improving the quality of life and return on investment for citizens. Argonne’s new research collaboration could help ease traffic congestion and energy use around Chicago’s O’Hare airport. Adaptable and easy to use, Argonne’s GTMax and other analytic tools have become an integral part of grid planning.